As it usually does, the Guggenheim all started with a good ol’ fashion love triangle. The very married Solomon R. Guggenheim was in love with the curator and German baroness Hildegard Anna Augusta Elizabeth Freiin Rebay von Ehrenwiesen (aka Hilla von Rebay). Their relationship, though never outwardly explained as intimate, was 100% intimate. One of the Guggenheim grandchildren put it best, “She was one of my grandfather's confidants -- and that's a wide field." She called him “Guggi” (barf) and he claimed financial responsibility for her love of art. Her taste was pretty impeccable though and so the Solomon R. Guggenheim Museum was born. Too bad, the Guggenheim family hated Hilla (she could be a bit betchy and was def sleeping with their dad/husband/uncle). Despite her thorough involvement with the building of the current museum, after the death of Solomon, the GuggenheimsTM made sure she never stepped foot in the building and expelled her from the board of directors. The zygote of the Solomon R. Guggenheim Museum was Solomon’s exhibit in his Plaza Hotel room. 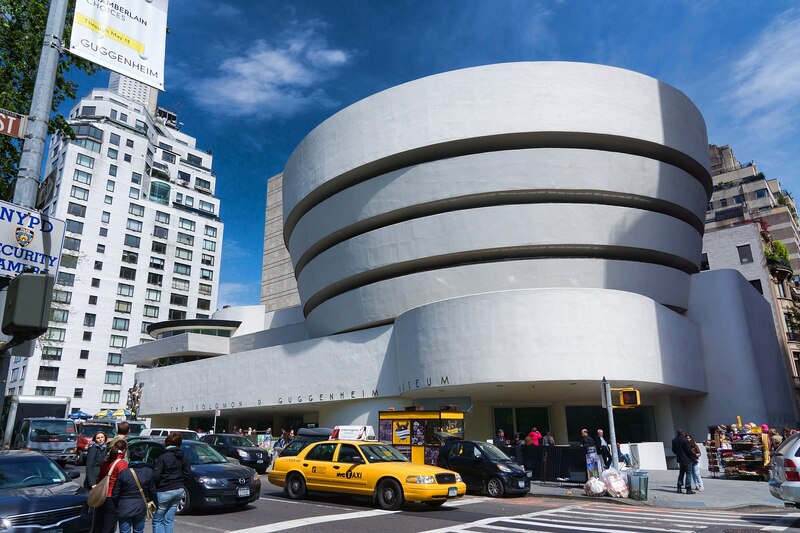 In 1937, the Solomon R. Guggenheim Foundation was founded and they began to rent a space in midtown Manhattan to display the work, where Robert De Niro’s father was a security guard. But soon there wouldn’t be enough space for their now giant collection. So Solomon and Hilla sat down and wrote a letter to the famous architect, Frank Lloyd Wright asking him to design a building for their modern art museum, which he accepted. 15 years and 700 sketches later, they had a plan. And in 1959, 10 years after the death of Solomon and only six months after the death of Frank Lloyd Wright, the museum opened its doors for the first time. The museum’s design was definitely the most outlandish the world had ever seen. They called it an inverted cupcake, a giant Jell-O mold, a washing machine, “New York’s Strangest Building,” a “temple of the spirit” and an “inverted ziggurat.” In 2008, the building was named a National Historic Landmark (rightfully so). This of course caused the manufacturing of ridiculous Guggenheim-related merchandize. For example, in the case that you want to brainwash your children into being an architect, you can buy a Guggenheim Lego set. Or if you want to wear rubble around your neck, you can wear “Restoration Rocks,” jewelry made from the leftover pieces of the renovation of the museum. You would think that the Guggenheims, one of the old money families of America, could do better than debris jewels, but who are we to judge? Knöfel, Ulrike. "Guggenheim's Muse: The German Artist Who Inspired The Museum Gets Her Due In New Show - SPIEGEL ONLINE - International". SPIEGEL ONLINE. N.p., 2005. Web. 27 Mar. 2017. "50 Guggenheim Facts". Facebook.com. N.p., 2010. Web. 27 Mar. 2017. "Solomon R. Guggenheim Museum". En.wikipedia.org. Web. 27 Mar. 2017. Check out the full Wikipedia article about Solomon R. Guggenheim Museum.